SSLVPN – Pulse Secure provides secure remote access to applications regardless of where those applications are hosted. Whether it’s legacy applications running in your own on premise data centers, or cloud based applications. Rich Client Support – With Pulse Secure, you get rich client support as well. Mobile workforce has changed the way people access applications and Pulse stays true to its principles in hybrid cloud models. Client support for iOS, Android, MAC, tablets, and PC give you flexibility in client support for your business applications. Network Access Controls (NAC) – Complete visibility, with contextual access control. Provides for granular control of your users sessions with a simple interface. Perfect for Regulatory Compliances from the most stringent industry and government regulations. 1. Platform and User License Sales – Performance suffering from old platforms? Is your company growing and in need of additional secure application licenses? Spico is a trusted Pulse partner who always focuses on what’s best for our customers. 2. Implementation Services – Deploying new or upgrading to new Appliances? – Let the professionals step in and get you up and running quicky! Best practices and complete setup. 3. Project Based Services – Installation of new Pulse Secure Appliances, Integrating with Cloud and On-Prem application access, rolling out of SSL certificates, authentication, and Network Access Controls (NAC)…we can do it all. 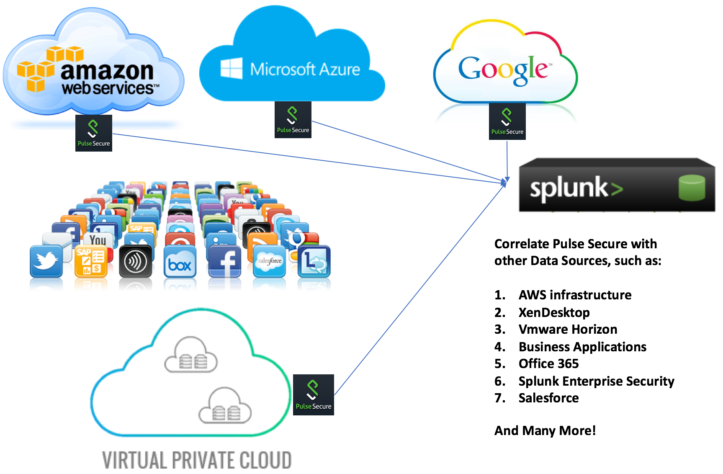 Spico Solutions is also an Elite Level Splunk Partner – Spico Solutions has integrated the Pulse Secure data with Splunk allowing you to view user sessions outside of what is available in Pulse One.